OMV AG is reporting group results for 2017. The operating result increased by 67% to EUR 688 mn. Net income attributable to stockholders amounted to EUR 367 mn. 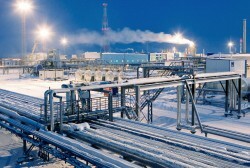 Data includes latest two acquisitions of a 24.99% share in the Yuzhno Russkoye natural gas field located in Western Siberia (see picture) and the purchase of 40% in SMATRICS, Austria’s complete provider for all services related to electro - mobility. See OMV Group Report January – December and Q4 2017 including condensed consolidated financial statements as of December 31, 2017 and Investor Relations Video below. This article includes a total of 520 words.